A variety of stormwater management regulations prevent and mitigate impacts associated with development activities, industrial discharges and the acute effects of concentrated populations and urbanization. 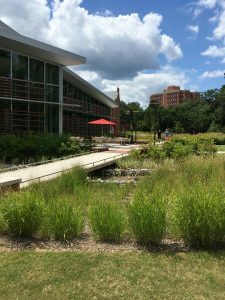 The university’s comprehensive Stormwater Management Program administers the requirements for the NPDES Municipal Separate Storm Sewer System Permit, Sediment Pollution Control Act and Neuse River Basin Nutrient Management Strategy. An illicit discharge (ID) is the introduction of anything into the stormwater collection system that is not rainfall or snow melt. An ID can be a chronic issue such as an improperly connected wastewater pipe or an acute issue such as someone dumping washwater down a storm drain. Because storm sewers discharge directly into local creeks, ponds and lakes without any treatment, eliminating IDs is a key component of preventing pollution. The university investigates illicit discharge events and takes action to eliminate confirmed illicit discharges. If you see someone putting something into the storm sewer, or observe an unusual odor or color in a local stream or pond, you should immediately report the observation to the university. Undisturbed, natural land absorbs stormwater runoff and protects the underlying soil particles from being wash away. 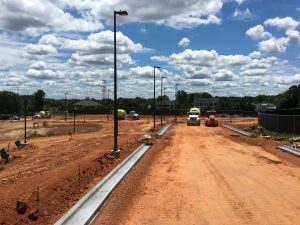 When construction begins, the protective layer on soil is removed. This sets the stage for soil particles to be loosened by erosion and carried away as sediment when it rains. Sediment carries other pollutants with it, can smother aquatic life and can cause localized flooding. Sediment is the #1 pollutant by volume in North Carolina! The impervious surfaces associated with development result in reduced absorption of runoff – so more water runs off faster, which can lead to localized flooding and increased pollutant loading in streams. Post-construction controls are required to moderate these affects. Pollutants that are exposed to rainfall or stormwater runoff are transported into local waterways. 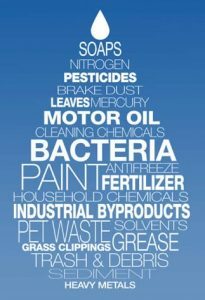 Pollution prevention focuses on eliminating the exposure of pollutants so that they can’t be washed away when it rains.